I was leaving the doctor’s office with my three kids when the homeless man approached us. He was in a wheelchair and he was missing a leg. I’d just gotten the kids buckled into their car seats when he approached asking for food. I “just so happened” to have a packed lunch with me. I also had recently been to the bakery, and I’d picked up some donuts for my grandma for a treat. I gave the man the lunch and offered him the biggest donut. His eyes grew wide. “Is this cream filled?” It turned out it was and the man’s face filled with joy. He ate it with pleasure. It was only as I backed away that I realized my kids had been watching everything. Even though I never intended it to be, that was a teachable moment. We talked about homelessness. We talked about caring for those God brings in our path. We talked about sharing what we had. We talked about kindness. And that night—as the kids shared about the experience with their dad—we talked about it again. 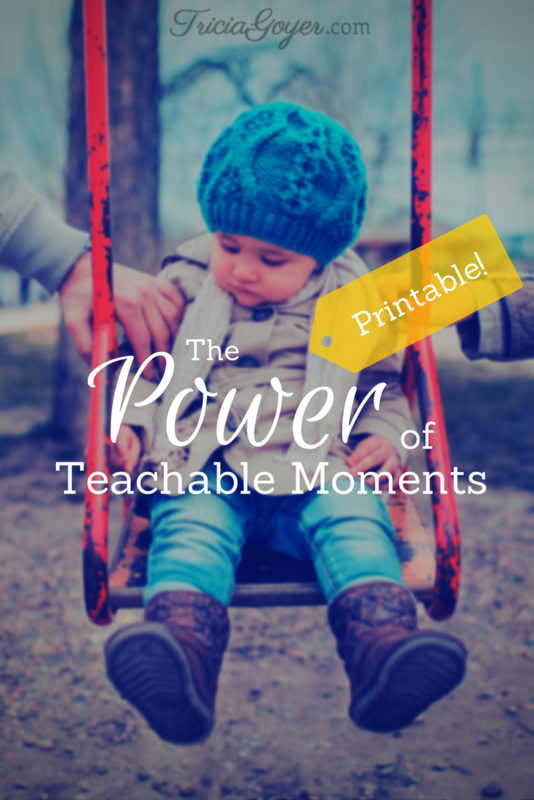 How can you take advantage of the unexpected, teachable moments in life? Here are some ideas from experts (and expert moms). I especially love the idea of sharing stories from my own childhood. There are lessons each of us have learned that can be passed on to our kids. Being real means owning up to our faults and exhibiting what it means to be humble and thoughtful. Seeing the way we respond will teach our children how to act. One day on the way to town we saw an accident and I told my kids we should pray for the drivers. Now every time they see an accident (or even someone pulled over!) my children want to pray. Whenever I see concern or worry in their gazes over anything I know it’s time to pray. I’ve found that eye contact with my children makes a big difference. When I take time to focus on their faces a connection is made. If they’re coming to me I want my children to know I’m available and I care. If I don’t take time to listen to my children about the little things, they won’t come to me about the big issues of life. I’ve found that bonds are built when I appreciate my children’s strengths. Making a list of those strengths, thanking God for them, and praising our children makes a difference in their hearts. And as they grow the connection grows! 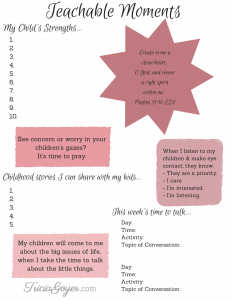 How do you take advantage of teachable moments with your children? God, show me the moments that I can use fully with my children. Allow us to take advantage of every second by creatively conversing and experiencing life together. Make me sensitive to the moments of life that will have a big impact on my child’s life. Click here to download the .pdf of highlights, points to remember, and further questions to apply to your parenting. Good post. It’s really tough sometimes, but the most powerful thing you can do for your children is to lead by example. It’s tough because I know I’m not perfect and I know I won’t be when we have kids. But I also realize it’s okay to be wrong, as long as you admit and work on it. My dad was terrible at admitting he was wrong, I think he was really self-conscious and wanted to be a good influence. But it didn’t work. We all knew something was wrong, and him opening up would have been helpful for everyone. Anyway, that’s just my two cents. 🙂 Good post!